In a large, heavy skillet, heat the olive oil over a medium heat until simmering. Add garlic and cook until fragrant, about 1 minute, then add the broccoli and toss well in the oil, cooking until completely tender (1-2 minutes). 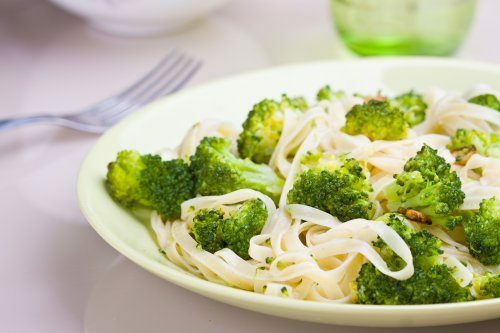 Add pasta to the pan with the broccoli and toss well to coat. Add half the Parmesan (optional) and the reserved pasta cooking water little by little until it creates a sauce that clings to the pasta. Season to taste with salt and pepper. Serve immediately with the remaining Parmesan.